There are so many successful stories of using the Intel Xeon D-1500 as the basis for a wide variety of home labs. 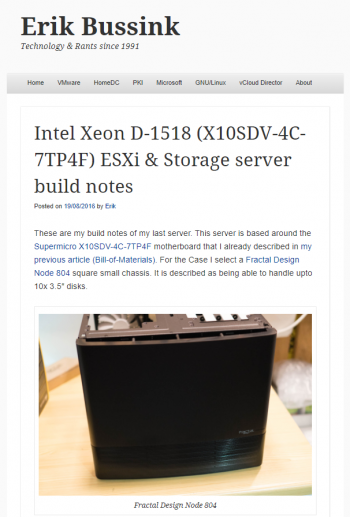 Many of these authors have many Xeon D articles, so be sure to have a look around at each of their sites. Most of these authors purchased their systems with their own money, but I still notate where each blogger works, since it's sometimes used as a part of their day jobs too. If I forgot a home lab story featuring Xeon D that I really should add to this list below, please drop a comment below to let me know! Here's a small sampling, in company name/last name alphabetical order. I love this story about a portable little system with lots of RAM, told by an IT Pro who goes on the road with RAM-hungry databases. But back in November 2016 my life changed! 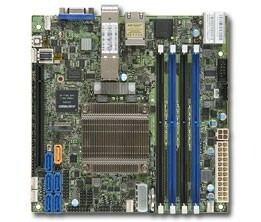 It was the first time that I had seen the SYS-E200-8D server from SuperMicro. So you’ll be thinking what I was thinking back in November 2016: 1500 grams would fit perfectly into my hand luggage for travelling, and having up to 128 GB RAM would be more than awesome to run VMware ESXi as my Hypervisor platform! Here is my money, please take it! Josh Stenhouse works in a technical role at Rubrik, and on his particularly awesome recent vBrownBag, he really gets into the weeds about how he built his home lab, along with the challenges he had to overcome. I figured this would be right your alley! He made 15 or 20 different revisions (prototypes) before setting on his finalized configurationW. due to idling host efficiency and HA config issues I had to switch back to ESXi and trusty vSphere with vSAN (6.5 Update 1). For me, vSAN is the best thing to come out of VMware in years. Why? Because it disrupts a legacy market, it works, it’s efficient, and most importantly, it’s integrated! I just check a box and go. 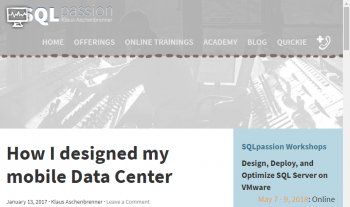 by Anthony Spiteri at VIRTUALIZATION IS LIFE! For me, where I do a lot with my home lab, and have for many years, I am most happy with my Supermicro and think it was an excellent choice. There were things now running in it which had an uptime requirement (mostly self-imposed) and that 16GB of RAM was almost always over-subscribed. 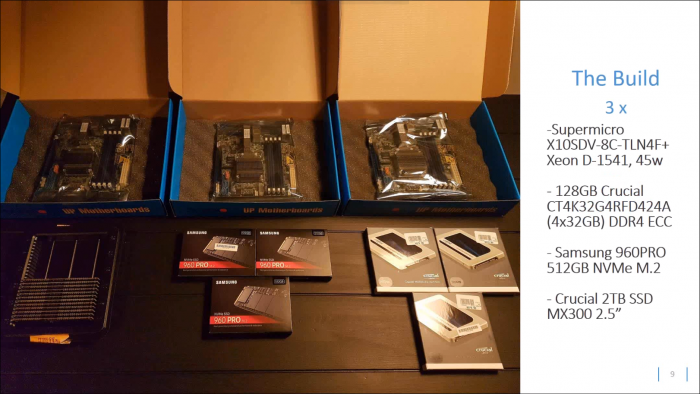 This all means that it was time for a home lab upgrade! There were lots of characteristics to take into account such as the lab’s footprint, cooling, power, connectivity, noise, and so forth. After a couple months battling back and forth between the new Intel NUCs and SuperMicro Xeon-D systems, I ended up going the SuperMicro route. It's worth noting that both Anthony Spiteri and Chestin Hay mention that they wish they had more than 128GB of RAM. Earlier this month, Intel announced the Xeon D-2100 System On a Chip that will help address this concern, at a higher price point. Read more about it right here at TinkerTry. Last week, some new competition called the AMD EPYC Embedded 3000 Series was also announced. The question is largely around whether anybody will ship one of these "edge/IoT" devices in a compact and quiet mini-tower form factor that is suited for home labs, rather than the 40mm 1U screamers that seem to be the focus, at least initially. Whatever happens, exciting times and opportunity lie ahead! I'm a full time IT Pro for the past 23 years. I've worked with IBM, HP, Dell, and Lenovo servers for hands-on implementation work across the US. Working from home over the past year as a VMware vSAN SE, I'm quite enjoying finally owning a lower-cost Supermicro solution that I can recommend to IT Pro colleagues, knowing it will "just work." That's right, no tinkering required.